2016 Super-Duper B5: Click, Clack, Moo ... Cows That Type! 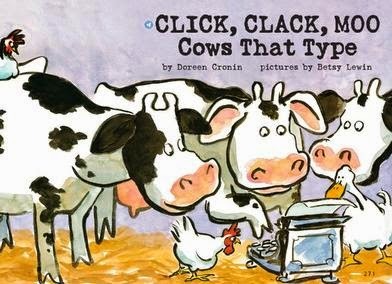 This week we have read and really enjoyed the book 'Click, Clack, Moo, Cows that Type' by the author, Doreen Cronin. We really liked watching this story we thought it was really cool and funny. Some of our favourite parts were when the ducks asked for the diving board and were jumping in the water, when the cows were sending messages and when the farmer gave them electric blankets.